TOTUL inclus! Aveti nevoie doar de incarcatorul si acumulatorul preferat si 4 baterii tip AA pentru radiocomanda!!! LIVRARE DIN STOC IN CULORILE DVS. PREFERATE! TOTUL inclus! Aveti nevoie doar de acumulator, incarcator si 4 baterii tip AA pentru radiocomanda!!! America's Most Popular Monster Truck Now 4X4! 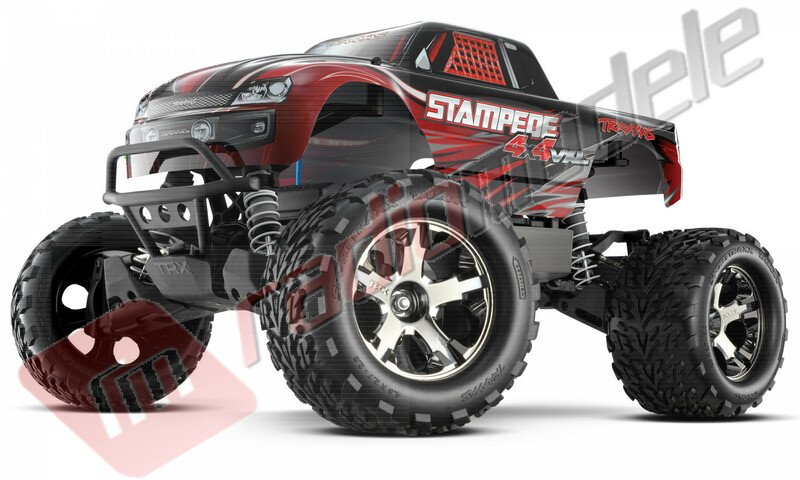 We take our monster trucks seriously at Traxxas, and the all-new Stampede 4X4 VXL is engineered like no other to turn extreme power into extreme monster truck fun! The efficient, low-mass drivetrain is totally optimized for the brutal torque of Velineon brushless power, and following the legacy of the Stampede name, this 4X4 is overbuilt and Traxxas Tough to withstand all the 4-wheel drive monster mayhem you can dish out. The patented adjustable wheelie bar is required equipment as Stampede 4X4 launches hard, sending the front wheels soaring for the sky. You're in full control with the high-output Traxxas TQ 2.4Ghz Traxxas Link radio system and the superior handling of fully independent suspension and smooth bellcrank steering. The Velineon Brushless Power System and a 8.4V NiMH battery combine to unleash 35+mph, right out of the box. Install a 3S LiPo pack, and Stampede 4X4 shatters the speedometer with 60+mph speed! It's brushless done the Traxxas way: brutally fast and easy to use. Just plug it in and switch it on to feed your need for extreme horsepower. *Battery expansion kit available (#6727X). **With optional gearing and 3S LiPo battery (items sold separately). 35+mph stock. 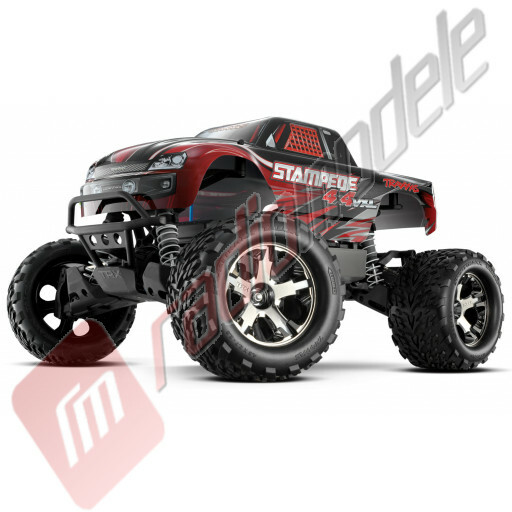 Automodel TRAXXAS Stampede 4x4 VXL (brushless) cu radio 2.4Ghz si TSM.